Losing data is just about every person’s worst nightmare. Until now. Boomerang is non-destructive data recovery software built from the ground up as a MacOS X Cocoa Application. 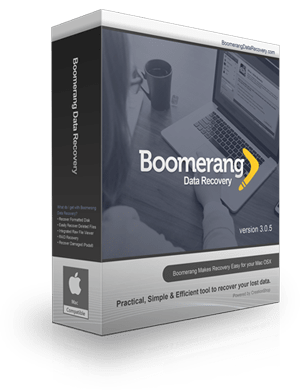 Deleted files, lost or damaged partitions, RAID volumes, camera/flash cards, and more… Boomerang Data Recovery Software for MacOS X is the best choice for getting your data back. Period. Try Boomerang now for [Free download] and see what it will recover for you! New for 2016, our mac recovery tools will recover even unrecognizable hardware on osx. Open even corrupted SD sim and camera cards, home to entperprise users have all benefited from how it works to get your data back! The easy drive wizard quickly scans to recovery/restore optimum methods even on unmounted devices. And, our undelete software recovers and unhide like a professional specialist. Trust Boomerang to recover your lost data today! Choose your platform. Download. Recover. It’s that simple to get your lost files back. Offers the lowest entry price and is designed for consumers. Activation doesn’t expire until consumed. Great for those with a little more data to recover and free use of Mac version too! Use on Windows AND Mac! Designed for IT Companies, Recovery Labs and power users who need a regular recovery tool. Always use the latest version of Boomerang! Six Brand New Recovery Modules in Boomerang Version 2.0! Our data recovery suite has all the power data recovery features so you can get your lost files back with ease Us developed. Quickly recover data from a formatted disk! Even a HDD with disk errors, internal and external hard disk partitions, recover all the files even when quick formatted. Even disks with errors, Boomerang is the best software to recover the files. Try it now, free! Accidentally delete your partition? Lost/Deleted partitions can also be quickly recovered from XP, Windows 7/8/10, and all Fat/32/NTFS internal and external hard drives. Free to try, you won’t be disappointed with the power data recovery features you’ll get with Boomerang! Recover all your files from an external (and internal) hard drive after format, even factory reset and recycle bin! Windows file recovery is quick and easy, recover your boot disk if it’s been infected with a virus, by name and date, Works with XP to 10. SD card recovery software and get your data back like a pro! Recover after format, bad sectors, damaged, deleted photos, and hidden files. Specially designed, free and best option to download. Recover RAW files quickly and easily. Recovery your RAID array with multiple volume options. From RAID0/1/5 ready, self service recovery with Boomerang will save you thousands over a professional service. Works with internal and external devices, our recovery tool is best rated. Try it now free. Recover your mobile phone, simply connect it via USB to your Mac and start Boomerang. Our quick and easy to use recovery tool will locate your mobile phone and get your lost/deleted files back in a jiffy. Will it work for you? Download risk free and try it today! Supporting File Formats and Storage Devices Fantastic support for a variety of media and storage devices, and of course open to try risk free without any obligation. You won't find a better source for recovery software. Boomerang Data Recovery will recover everything thing it finds on your storage device, regardless of the file extension. So even if your extension/media/storage device is not included in this limited list, we encourage you to download the version and try it risk free to determine if your data can be recovered.